Last night I had started a post about Burberry and didn't get round to posting it, then a remark that Looking Fab in Your Forties made today, about getting nabbed by the Burberry Police @ their Puerto Banus branch, for trying to photograph a 'sublime' plum coloured aviator jacket, reminded me that I'd dropped the ball. The thing about Burberry as a brand, and Christopher Bailey as a creative force, is - this is strictly my own opinion, mind you - the way he can take a theme and just expand it, play around with it.. it's really worth looking round the site or better yet, if you can get to a store, just spend some time absorbed in his head. It must be quite a magnificent head. For example: take these three looks, above. It's almost Emperor's New Clothes the way every brand, from high end to high street, took his aviator jacket as shown on the top left and scrambled to get their own version made - took the khaki & brown palette - and yet, when I was walking round the store, what captured my imagination was the SAME PLUM COLOURED AVIATOR JACKET - with the softest feathery 'shearling' collar - that Looking Fab almost got nabbed in a resort on the Costa del Sol, for trying to photograph. And I don't feel he always gets it right. The top right one, for example. He's trying an idea, playing around with quilted parka material, which is going to be huge this winter, but it just doesn't do it for me, in that shape, with that dress. Is it just me? I mean, even the model doesn't seem comfortable in it, and no matter how thin one is, it's bound to chop them in half and making them look and feel.. chunky. But then again, these jackets... I didn't dare try anything on, but I just stood there a while like a toddler, transfixed with playing with the zipper. I didn't even try to take the jacket apart into two pieces, just marvelled at the idea: for the mere price of £1,295 (over $2000.00!) you actually get two jackets in one: a short cropped navy, and a longer shapely silhouette (or, conversely, you could simply appreciate the craftsmanship and creative genius, then go on said holiday to the Costa del Sol for a week). You know (or perhaps you don't) that pretty much everything on my post is my own photography (apart from recent self portraits which are usually from my non-photographer husband, Mr. Dot, who seems to like to start shooting before I'm actually ready to pose). This time I'm making an exception, using photography from Burberry's own site. Thanks Burberry! I guess what I"m trying to say is, from everything I've read and heard about the man, he lives quite simply, he's delightful, warm, friendly, not remotely a diva, and clearly has such fun and takes such joy in taking themes and just playing around with the ideas. He inherited a brand known for two things: tan trench style raincoats, and a certain plaid check pattern in rather dated colour scheme. He's almost made us forget it was All About the Trench, and now that it's All About the Aviator, what I'm getting all excited about is midnight blue wool pea coats, or again, that sublime Burgundy wool felt number. In one room, I was in the colour scheme I got all psyched for while on holiday in the Dominican Republic: the cool jewel like colours of the purples, with navy, olive green..
And while I know for most of us it's all about the shoes, I'm not even going to go there in this post. For once, altho I am so not an It bag girl - I haven't bought anything over £100 since my Coach days back in NY - I still have to marvel at the way he's kind of exploded the iconic check into all directions. He's like the Picasso of the fashion industry for me. Perhaps his piece de resistence for me at the moment, tho, goes back to his Burberry roots. A trench. In white. MADE OF FREAKING FEATHERS. This is, for me, what it's all about. (And at nearly £3000, or $5000 USD, one could go on QUITE the holiday). He's taking a RAINCOAT, for goodness sake, and making it out of feathers. He's taking the piss out of himself, in a sense, and of his brand, while at the same time, making us look twice, and appreciate the beauty, the craft. I just can't wait to see what he does next! First let me say this - like ripping of a band aid - I seriously HATE those bags. Great post about 'The Burb' J.
Christopher Bailey is a true innnovator and visionary that took a brand that had been hijacked by 'undesirables' and turned it around to become one of the most coveted brands today. We mustn't also forget the vital role it's CEO Angela Ahrendts has played in terms of market placement and they both have created a multi-billion dollar brand. These two are a force to be reckoned with, just like Tom Ford was at Gucci with Domenico de Sol. This was such an interesting post to read - and I totally agree. 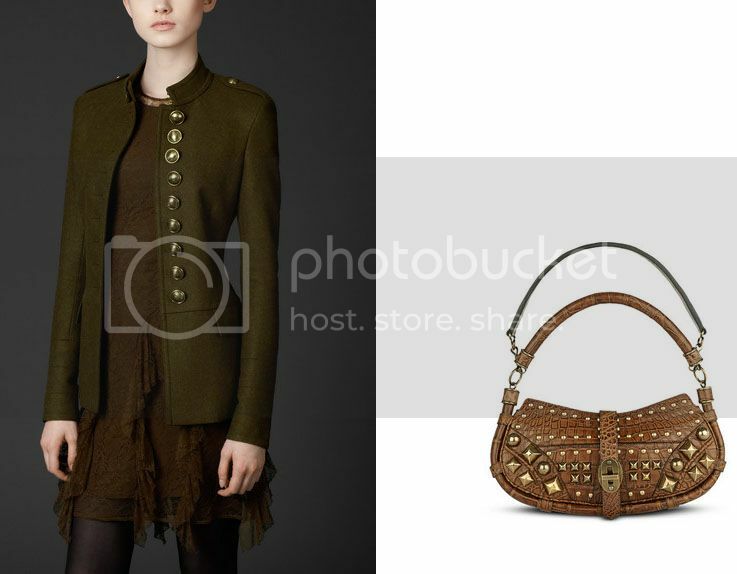 I've noticed that Burberry seems to be the brand I reference the most on my blog now. Mr Bailey really has a knack for creating clothes that are both aesthetically pleasing to look at, and very desirable in terms of wanting to try them on! Being interested in fashion design myself, I definitely think of him as a role model for how to get it right. And that feather coatat the end is amazing. I wish I coud use pieces like that to take photos of for my fashion shoots! 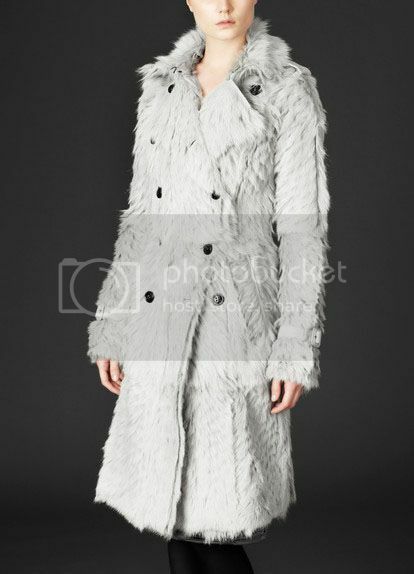 I can so imagine a model in that coat by a lake, with early morning mists rising and the sun coming up - coat would almost blending in with the mist. And the jewel-like colours have worked particularly well this season. I am loving them all! Thank you, Roz, you're so sweet. I would so love to see shoots of you in Burberry: in fact if my fairy godmother gave me a dream job it would be to do a fashion shoot with you and some of my other blog/model friends, in a mixture of vintage and Burberry, where we do our own styling. Chris/Angela, are you reading this? David (Nyanzi) you're absolutely right. I didn't even realise she was still at the helm but of course, it makes sense. I'm reading the wikipedia thing on her now: it's quite uncanny. There are several American brands, powerful female names like Liz Claiborne and Donna Karan.. she's got some kind of midas touch... oh and Henri Bendel! This woman is SCARY. In a good way. I don't think I have seen anything so beautiful in the flesh, than that plum aviator, I came over all funny, like when I see a fluffy little kitten and you want to stroke and cuddle it! Mind you, that Feather Trench comes a close second! It's uncanny: that was exactly the same experience for me! I'm never like that (hardly ever). I'm not at all a 'wish list' kind of person - well that's a total lie, of course I want certain things - but I'm not the type to go crazy over designer clothing. But this.. I really was petting mine, too (see? I'm already calling it 'mine'). Just like a fluffy little kitten. Did you name yours? Apart from Sublime Plum Coloured Aviator Jacket? I suppose I could call it Plummie. I didn't see the Feather Trench in the flesh. That WOULD be like petting a fluffy little kitten. A giant fluffy little kitten. You are so brave for even going into Burberry and not buying. You must have an iron will to not buy or even try on. 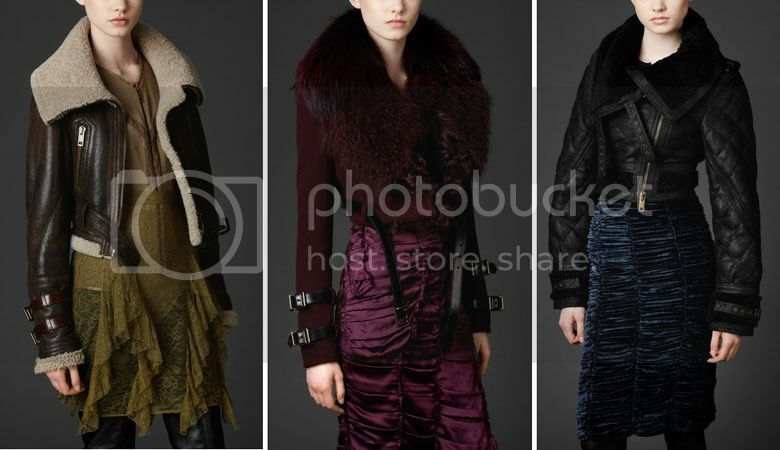 Truly beautiful clothes, Christopher Bailey is a genius. PS I am a big fan of your blog and love what you do. The secret is simple: I know that my husband would kill me. The survival instinct is stronger than the urge to own these clothes. (That's the thing mother never tells you: when I was single and an adult, living on my own in NY, I was free to make decisions on my own. I wasn't insane about spending, but I also had credit cards and could think 'oh well this will be worth it and besides someday I'll get married and my husband can pay off my credit card bills'. Which he did. But then you get into the whole 'I don't like the way that looks on you...' I swear, Dev, it's worse than parents. I really wish I knew that aspect of marriage before I got into it. The secret, I think, is to treat places like Burberry like the British Museum. You might admire a mummy, say, without feeling the urge to climb into the case. Just the fact that they let us fondle the merchandise is enough for this polka dot! Lately Burberry become one of my fav! They have changed a lot in a great way! Despite not knowing a lot about Burberry or Christopher Bailey, his designs seem to have this colossal impact on everything related to fashion! The way he interprets classic designs are inspirational, I mean who would think of creating a feathered trench coat, yet strangely, it works. I love all of the jackets! wow- I'm looking forward to the coming trends this year! strange feather coat......could live without this one- kinda creepy.